A new international poster for Prometheus has been revealed over on Latino-Review. It doesn’t contain any new images unfortunately. Their version is from the Netherlands, I believe. The one below is from India. In related news, there’s also a French poster that we’ve not seen before. Thanks to Seeasea for the news. After 2 pages of unoffical moronity - it's good that it's at last been made official. SM, always the voice of reason haha . OK...this thread has officially gone moronic. It's called atmosphere. They've used the archetypal imagery from the film to create a mood and give off a vibe to viewers. I think it works and looks fantastic. No over-reaction... the head is not 100 ft. tall... so why would it be in the poster? I never remember the egg floating in space with green mist in the first movie... it'called artistic licence. Same could be levelled at the original Jaws poster... or the original Star Wars ones (that bear little resemblance to what actually goes on in the movie). Accentuating the shape/size of the thing to look more imposing than it actually is, may be the idea. You don't have to like it, but it doesn't make it bad. Not really - if you look at the radius of the mouth of the shark in the poster, it makes it about circa 50 ft. Compare it to the production still of Spielberg lying in the mouth of the Shark. As for The Star Wars posters - yes indeed things were over scaled. Vader's head is usually a giant head in the background and Han & Leia in the 'Empire' poster dwarf everything else, in a pose that was never in the movie. It't ok to agree to disagree… I know the head has been the watershed scene from whats been shown… but I simply think this poster is lazy and misrepresenting. Your Jaws example makes sense, Jaws 2 would probably be better… I think it seems lazy. It's strange how the big-giant-head seems to look different in nearly every pic (or poster) I've seen of it. Perhaps it's just due to the differing angles of reference. Quite like it, and the alt version a little further up. Nice to see a poster going for iconography rather than just a cast line-up composite. How about this bad boy? I wasn't complaining and I agree with you that there's a severe lack of this type of poster today. Don't worry, giant French Noomi head will protect you! And we'll call in wrong scale Kong and Fay Wray just in case too. Nevermind the head. What about the ampules? They're Ginormous! When I first saw the Alien VHS box at my local grocery store video section... (yes they used to exist) the image disturbed me, but once I had seen the movie and looked at it more, it didn't translate to anything I had seen and it didn't make sense, not even in a cool abstract way. Oh, come on now You're surely arguing for the sake of it here. In the french posters it's much bigger then the temple itself! But not as big as Shaw's. "Christ I hope this pays off!" That tag-line is still too frigging cheesy. Maybe they're being satirical and talking about the studios end? I'm pretty certain more than 100 million went into making this film. This new poster is good but not as cool as the US poster. The worst thing about it is it doesn't detail how many the musical numbers there will be. I think the Indian poster is terrible. It's not a bad idea – I can go with that – but the execution is very poor. Didn't we see a very similar image with the original Entertainment Weekly story? At that time I thought it was something that the magazine's designers had photoshopped which would account for its poor quality; the perspective is out and the proportions between the figures and urns are clearly wrong. That said, foreign move posters are often left to the discretion of the marketing teams in those territories and may well appeal to people in those countries – remember the famous Alien posters from Poland? The Indian Prometheus poster evokes Hindu idols and imagery so I can see why they might have gone with that. 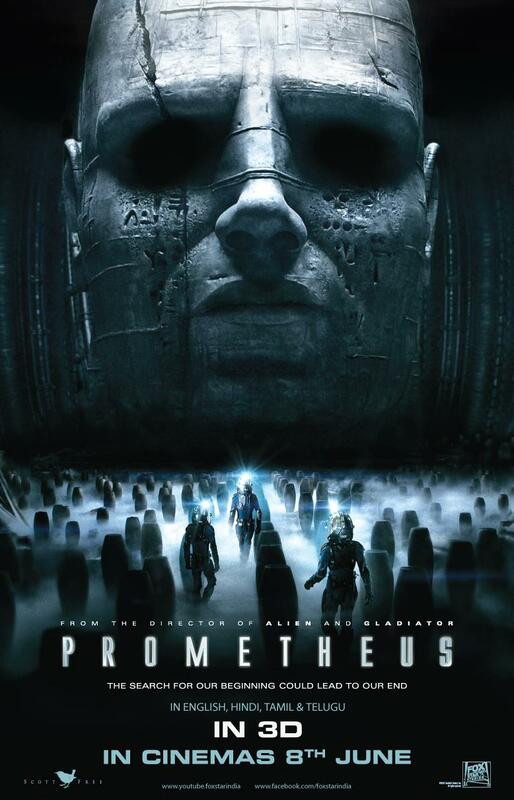 I'd like to see a new poster for Prometheus. Avatar had a minimalist teaser and then a few variants for the movie's release. I'd like to see the same treatment for Prometheus. That poster is terrible! I like how the original poster was mysterious and had the right amount of dark and the right amount of the head illuminated by Shaw's torch. It looks beautiful. Hell, I've seen far better fan posters than the international poster. The scale on the head has been altered to make it appear much larger than it actually is... which I hate. If the head was supposed to be that large and menacing than it should have been that large... when all the other shots shows a much smaller room and much smaller head, it makes this poster pointless. dafuq does the head do on the road?! They like their gigantic humanoid statues displayed outside. Original teaser is a hundred times better. I agree, the head just looks cheesy in this one.